Most Canadians across the country can look forward to a warmer-than-normal winter, right through until spring, according to Environment Canada's latest forecast. The prediction for February, March and April comes after an unseasonably warm couple of months, said CBC meteorologist Johanna Wagstaffe. "Almost the entire country is looking to come in above normal for temperatures.… So those of you who were worried that the winter was on hold and was going to ruin our spring, the climatologists are not thinking so." Environment Canada's updated forecast is an about-face from the weather agency's prediction in the fall for a frosty winter season. Instead, this has been one of the mildest winters on record. In January, temperatures were at least three to six degrees above normal across most of the country, Wagstaffe said. 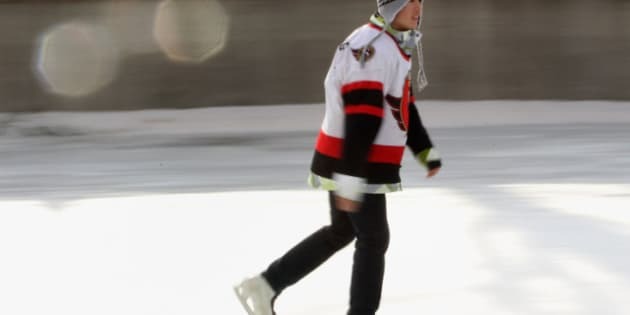 In southern Manitoba, temperatures have often been far warmer than normal for this time of year, causing problems for ice rinks, winter roads, ski hills and businesses that rely on the cold and snow. In Winnipeg, the average daily high in December was –3.5 C. The normal is –9.7 C. Snowfall for the month was 5.2 centimetres, while the normal is 19.8 centimetres. Climatologists based their earlier prediction of a chilly winter on La Nina, a weather pattern that normally means colder winters. But the Arctic air that usually moves south has stayed put because of a strong jet stream. However, this trend is of little comfort to people in the Maritimes, who are experiencing winter in full force on Wednesday, said Wagstaffe. Heavy snow is falling in Fredericton and Saint John, but the Bay of Fundy region will be hit the hardest, with as much as 25 centimetres of snow. Many school districts have cancelled buses. "Winds will be gusty, reduced visibility. Definitely a tricky driving day," Wagstaffe said. Newfoundland is expected to get as much as 10 centimetres of snow early Wednesday. Halifax, however, is on the border of this weather system, and will likely see a mix of snow and rain. Ottawa and Montreal were dealing with freezing rain early Wednesday, but this is expected to taper off as temperatures warm up, she added. Although temperatures in southern Ontario reached as high as 13 C on Tuesday, temperatures are expected to drop in the area under a cold front. "It's a much cooler afternoon than the morning," Wagstaffe said. Vancouver will see some sunshine Wednesday, briefly, after days of rain, but more wet weather is expected to return by Thursday, Wagstaffe added.